Over the last year I’ve been working on a lot of new projects at work. Because of that it’s required me to work a lot extra hours. In my off hours my wife and I have been focusing on landscaping or just not IT related things. During that same time I had to 2 issues come up, FreeNAS failing at life and Code42 decided kill CrashPlan for Home Users. Up until now my MediaServer virtual machine has been the main server in the house. First and for most it was the Plex server serving up my ~5 TBs of TV Shows, Movies, Home Movies etc. Secondly it was also our file server, and lastly it was out backup server. All the computers in the house have the CrashPlan agent installed on them and would back up to the MediaServer. Then MediaSever would upload it to the CrashPlan/Code42 cloud. The whole reason for the FreeNAS build and the move to Windows Server iSCSI target was really to hold the MediaServer virtual machine. The ESXi host that provides the CPU and Memory to the MediaServer virtual machine is a Cisco UCS M240 M3 with Dual E5 Xeons and 64GBs of RAM. The 2 downsides of the servers is that it only takes 2.5 inch drives and there is a premium on eBay for Cisco UCS Hard Drive caddies. 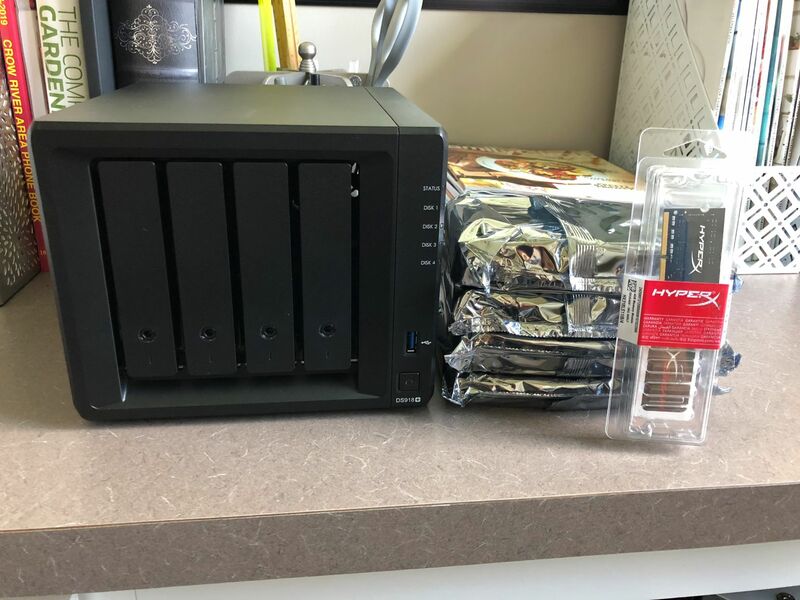 Obviously, for a homelab Cisco branded hard drives are out of the question at $600 for 1 TB. My wife loves Mac computers (I don’t know why) so we need to back it up. I use Windows and like the Veeam Agent for Windows. The free version of the Veeam Agent for Windows Supports backing up to a File Share. I have Veeam Backup and Replication deployed to back up the other virtual machines. Veeam Supports using a File Share a Backup Repository. By using a File Share it reduces the need for a NFS or iSCSI datastore within ESXi to hold the backups. This one is straight forward. I need to create file shares to hold our documents. Over the years I’ve spent a lot of time ripping all of our movies and TV shows and we’re accustomed to watching our library on Rokus and XBOX Ones around the house. Anything to reduce manual maintenance is a win. At this point almost, anything is more efficient then running 2 ESXI hosts. I’m looking to cut this in half. The main goal of all of this is to keep it simple. I looked into solutions like owncloud and nextcloud and they some of that list but not all of it. I also looked into building a new Plex server and moving it out of the virtual environment. That would solve a part of the problem but not all if. To be honest in a year of 2 when 4K ripping is more common/standardized I’ll probably do this and make the plex server the ripping server too. I decided to max out the memory right now for a little future proofing and to reduce the need to hunt down random hardware 2-3 years down the line. On Synology’s Website it states that it can only go to 8 GBs of RAM. There is multiple reports saying that the people have increased the RAM to 12 and 16 GBs. I’ll look into that option when I get there. I picked the Synology DS918+ for the following reasons. The unit has 4 hotswap bays so it allows me lower capacity drives to make a large storage pool and better throughput. The unit has 2 slots for NVMe drive slots. I doubt the intended load of this device will need to use the SSD caching. But if it does I can easily add the cache without having to sacrifice hard drive bays. Or if I deploy one of the Synology applications that could use really fast storage. I can add a second volume without having to buy the expansion bay. The unit has 2 nics for creating a LAG. This will help when uploading/downloading content. 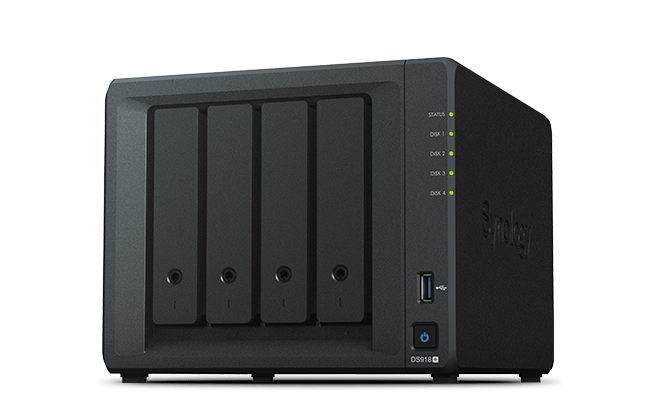 The Plus series Synology has better CPU, expandable Memory, and a 5 year warranty when compared to the value series or J series. This unit is rated the 3rd best unit on nascompares.com for Plex. I can add a 5 bay expansion unit over eSATA if I max out the storage in my initial build. The one thing I was hoping for was 10GB connectivity or the option to add it. But after doing the math, in this current deployment it wasn’t worth extra cost buying a unit that had it built in or the ability to add it. To really take advantage of 10GB the unit would have to have at least 10-12 Mechanical hard drives or SSD storage. In my case, (I wish I could) I would have to buy 10 1 TB SSDs or 5-6 2TB SSDs to get in the realm of required raw capacity needed. Truly, running a file server for 2 people and plex doesn’t require SSDs by any means. Also the built 10GB units use copper based 10GB ports and all I have is fiber based 10GB switching. This would require me to buy a new switch as well…. or Fiber to ethernet adapters. In the upcoming posts I’ll be going through the process of setting all of this up.